Christmas is a perfect time to display your favorite photos, especially those evoking warm memories of family and friends. Even when the holiday season ends, photos reflecting your personality and interests are great to have in view. A unique way to display your photos is to affix to your furniture. Not only will they bring a smile to your face, but you will have customized furniture that is like no other. 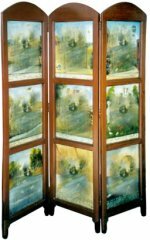 A screen is a versatile furnishing to have in your home. It can serve as a room divider in the living area, or stand against a blank wall to act as a focal point. You can use it in the bedroom, dining area, and even the bathroom. Customize your screen by hanging your favorite photos, just as you would on a wall. Vertical columns of equally sized photos and frames create a neat arrangement that instantly brightens up a living space. Alternatively, at some home furnishing stores you may find photo display room dividers that hold photos on both sides. Decoupage is the art of decorating a surface with pieces of plain or colorful paper, sealed with a few layers of varnish. This technique can be used to display copies of your favorite photos on old furniture. For example, you can decoupage the side surfaces of a chest of drawers in your bedroom with photos of your travels around the world. Or decoupage the top of a café table in your patio with photos of flowers and foliage. You will need to prepare the furniture surface first, by cleaning and sanding it lightly. You may want to paint it a different color to provide an attractive background for the photos. Arrange your paper copies and glue them onto the surface of the furniture with Mod Podge or similar type of glue for decoupage. Apply a layer of Mod Podge over the paper with a foam brush and let it dry. Continuing adding layers of the glue over the surface and let each one dry until you achieve your desired look. An existing coffee table in your living room can be dressed up in a personal way with photos of family and friends beneath the glass surface. 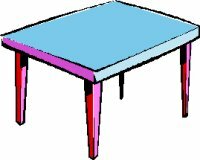 At your local home improvement store, you can get a piece of glass or Plexiglas’s cut slightly smaller than the area of your table top. Arrange your photos on the table surface and carefully place the glass on top. Be sure you use photocopies and not original photos, especially if you don’t have digital copies, since there is a risk of them getting stuck to the glass or becoming damaged with water. Multiple, small, identical photo frames are ideal for using as unique decorative trim along the top of a headboard, on paneled doors of an armoire, or the wide frame of a cabinet, for example. Paint the frames a coordinating or contrasting color to the furniture, fill them with your favorite photos, and attach them onto the furniture surface with hot glue. Professional designer Jessica Ackerman, writes for WallDecorandHomeAccents.com and is an authority on decorating with home decor wall art and wall sconces for candles.